A project to sequence the genomes of five microscopic species that grow and live in boiling hot conditions, members of the domain Archaea, has received support from the Community Sequencing Program of the Department of Energy. Two UCSC researchers, biomolecular engineer Todd Lowe and environmental toxicologist Chad Saltikov, share the project with astrobiologists Christopher House from Pennsylvania State University and Sorel Fitz-Gibbon from UCLA. 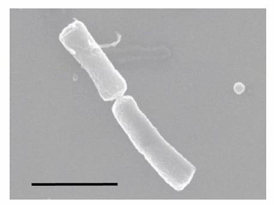 The particular Archaea being studied are three members of the genus Pyrobaculum and the closely-related species Caldivirga maquilingensis and Thermoproteus neutrophilus. Pyrobaculum species all respire toxic metals, such as arsenic and selenium, or sulfur compounds, ferric iron, nitrate, or oxygen. Lowe says, 'With these new genomes, we should be able to focus and accelerate our study of the group of genes that enable survival in one of the harshest environments inhabited on our planet." Understanding the unusually complex metabolisms of these organisms could also shed light on geological processes. The genome of Pyrobaculum aerophilum has already been sequenced, but the species has proven difficult to grow in the laboratory. The species to be sequenced in this project are all easier to work with. Through comparative genomics, researchers will be able to study their evolution and determine how their genes are regulated and relate to functions. These species have broad metabolic diversity, and a large proportion of their genes have not been studied in any other organisms. House adds, 'I am excited that we will have a diversity of related species to study at the genomic level. In particular, our project includes related species with a variety of sulfur metabolisms."